BirdCagePortal.com - Pet Bird Supplies, Parrot Supplies, Cages & Bird Products - GFCASM - Central Amercian Blend II - 25 oz. GFCASM - Central Amercian Blend II - 25 oz. 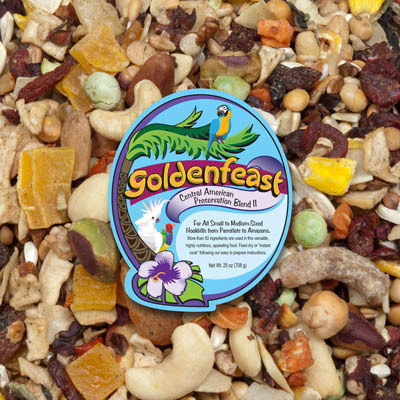 Goldenfeast Central American Blend II - 25 oz. Fruits and Ingredients are dehydrated unless otherwise noted. The In Shell Georgia Pecans add natural foraging to this exquisite formula. The pecans can be easily cracked by you or naturally cracked by the larger hookbills. This mix does not include peanuts. Ingredients: Almonds, Cashews, Safflower Seed, Granola made with: Rolled Wheat, Brown Sugar, Canola Oil, Natural Coconut, Sweet Dairy Whey, Oat Flour, Roasted Almonds and Honey, Roasted Corn, Organic Cranberries and Blueberries, prepared with Organic Sunflower Oil and Organic Cane Sugar, Buckwheat, Carrots, Whole Organic Oats, Whole Pumpkin Seed, Naturally Cinnamon Flavored Crispy Apple, Natural Flaked Coconut, Georgia Pecans In Shell, Cubed Coconut, Natural Mango and Pineapple, Roasted Chic Peas, Organic Wheat, Pine Nuts, Pepitas, Garden Peas, Whole Star Anise Seed, Apricots, Beets, Dates, Cantaloupe Seed, Cherries, Freeze Dried Cane Molasses, Green Cabbage, Sweet Peppers, Sweet Potatoes, Freeze Dried Strawberries and Mangos, Cooked dehydrated Beans, Goji Berries, Chamomile Flowers, Freeze Dried Spinach, Wild Flower Seeds, Sweet Corn, Sweet Peas, Whole Bee Pollen, Natural Flavors of Orange, Lemon and Blackberry, dried Lactobaccilus acidolphilus fermentation product, dried Lactobacillus plantarum fermantation product, dried Enterococcus faecium product, and dried Bifidobacterium longum fermentation product. Serving Instructions: Feed dry or instant cook by bringing 3 cups of water to a boil, remove from heat. Add immediately 1 ½ cups of Central American II, stir and cover. Steep for 45 minutes, or until cool. Freeze any remainder in ready-to-serve containers.